The data company Spire Global has announced the launch of its 100th Glasgow-built satellite. The Low Earth Multi-Use Receiver (Lemur) satellites are designed to gather data on shipping, weather and aircraft. The company, which is headquartered in San Francisco, says it has the world's largest weather and climate observation constellation. And it plans to have 175 of them in low Earth orbit. Each Lemur is based on the small CubeSat design. The basic unit is a 10cm cube - a litre of instrumentation. The Lemur is a so-called 3U design - a stack of three such cubes. That's not much more than the volume of an extra-large bottle of supermarket cola, but miniaturisation means a lot of sensor power can be crammed into a small space. It also means a satellite that can piggyback on a rocket carrying a larger payload into orbit, cutting launch costs. 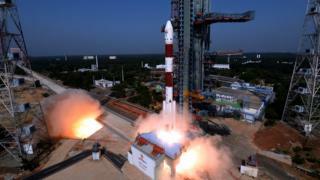 The latest launch carried four Lemurs aboard the Indian Space Research Organisation's PSLV-C45 rocket. Once in space, the CubeSats made their final leap to orbit from a deployer built by the American company Nanoracks. Its basic principle is simple: the satellites are shot into their correct positions by a spring mechanism like an orbital jack in the box. Spire Global styles itself as a space data analytics company rather than a satellite builder. It uses its satellites to gather information from parts of the world which can be difficult to monitor. They harvest weather data from otherwise remote regions and track ships and their cargoes sailing far beyond the reach of coastal radar. They can also track aircraft. The resulting datasets are quickly made available to customers across the world. They are marketed to shipping and insurance companies wanting to control risks, and to coastguards and other agencies fighting piracy and illegal fishing. Spire chose Glasgow as its European base because of the city's existing expertise in space technology. The first Scottish-built satellite was UKube-1, a 3U CubeSat built for the UK Space Agency and launched in 2014. It was assembled in Glasgow by Clyde Space, which has now been bought by the Swedish space company AAC. Clyde Space continues to be a major player in the market for CubeSat components. Scotland has a burgeoning space tech sector which has created thousands of jobs and now more than 100 satellites. Other firms are planning more satellites and launch vehicles. But there are already more Glasgow-built satellites in orbit than from any other city in Europe.